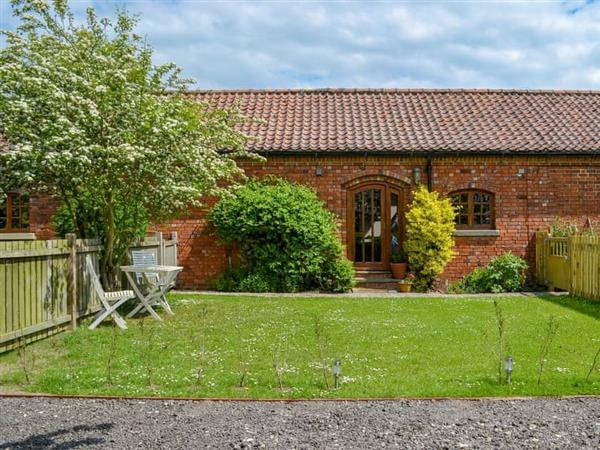 Till Barn at Manor Farm Stables in Broxholme, near Lincoln, Lincolnshire sleeps 2 people. Manor Farm Stables near Lincoln are on the edge of the owner’s working arable farm; there is something to entertain all ages, with good walks and cycle routes from the door. The medieval city of Lincoln is within easy reach and this beautiful city is famous for its cathedral, castle and Bailgate area which offers many gastro pubs, cafés and restaurants to enjoy. There are several fahttps://lincolnshireshow.co.uk/mily orientated events hosted at Lincoln castle throughout the year, and the entrance to the castle grounds are free (wall walks and the Magna Carter Museum at cost). In May the Lincoln Grand Prix goes through the cobbled streets, and in June the Lincolnshire Show displays everything Lincolnshire is famous for. The International Bomber Command Centre is nearby and is well worth a visit. The market town of Newark, known for its antique fairs on the showground is 21 miles away. With the The Red Arrows base at Scampton just over 4 miles away, you might just get your own air show in the sky as they practice manoeuvres. There is a shop, pub and restaurant all 2 miles from Manor Farm Stables near Lincoln. Barn End (ref UK11153 [Barn End]) can be booked together with Till Barn (ref UK11155) to sleep up to 6 people. Till Barn is all on the ground floor. Living/dining room: With 32’’ Freeview TV, DVD player, DAB radio and quarry tiled floor. Kitchen: With electric oven, electric hob, fridge/freezer and wooden floor. Bedroom: With king-size bed, beams and wooden floor. Oil central heating included. 1 small dog welcome. Both properties: Electricity, bed linen, towels and Wi-Fi included. Welcome pack. Lawned garden with sitting-out area and garden furniture. 1 small dog welcome. Bike store. Private parking for 2 cars. No smoking. Holidays at Till Barn, Manor Farm Stables run from Friday to Friday. Pets allowed at Manor Farm Stables - Till Barn. For a better idea of where Manor Farm Stables - Till Barn is, you can see Manor Farm Stables - Till Barn on the map below. Manor Farm Stables - Till Barn is in Lincolnshire; should you be on the lookout for a special offer, you can find all the special offers in Lincolnshire. It's always worth checking to see what is on offer at the moment. Do you want to holiday near Manor Farm Stables - Till Barn (UK11155), you can see other cottages within 25 miles of Manor Farm Stables - Till Barn; have a look to find your perfect holiday location.